Paramount Pictures. Released February 10, 1939. 70 minutes. 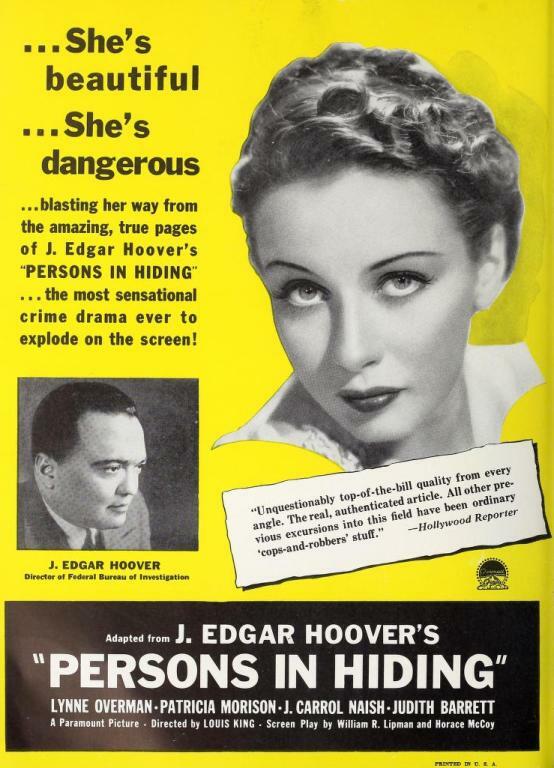 Based on Persons in Hiding by J. Edgar Hoover. Adapted by William R. Lipman and Horace McCoy. Directed by Louis King. Starring Lynne Overman, Patricia Morison, J. Carrol Naish, William Henry, Helen Twelvetrees, William Frawley, Judith Barrett, William Collier Sr., May Boley, Richard Stanley (Dennis Morgan), Dorothy Howe (Virginia Vale), John Hartley, Janet Waldo, Richard Denning, Leona Roberts. This 1939 gangster “sleeper hit” was the first of four films spun to the screen from J. Edgar Hoover’s 1938 book, also titled Persons in Hiding . While Lynne Overman earns top billing as lead G-Man, he’s distant third fiddle to Patricia Morison, electrifying in her debut role, and character actor stalwart J. Carrol Naish, who portray a pair reminiscent to Bonnie and Clyde. It’s sociopath meets psychopath when small-time hood Freddie Martin (Naish) connects with frustrated beautician Dot Bronson (Morison) at the Glenby Beauty Parlor. Martin had spotted Dot’s boyfriend, Joe (John Hartley), collecting a $40 debt nearby and followed him to the beauty parlor, where he joins Dot. Dot had just finished dropping Joe for being a cheapskate, and moments later she's coolly urging him to stand-up to the gunman. Freddie makes a crack to her and Dot kicks him in the shins and then smacks him, the same one-two she later applies to William Frawley from a seated position. Joe finally makes his move, but he winds up knocked down and out. Dot gives Freddie a hard time for pulling such a petty heist. “You small-time crooks haven’t any imagination,” she tells him. In response, Freddie takes Joe’s forty bucks and commands Dot to drive him out of town in Joe’s car. She does, and she does with unexpected zeal, taking Freddie by surprise when she chooses the right moment to pull off into the woods and lose the police. He’s intrigued by Dot and thinks they could get along well. Dot has no intention of being small time though, and tells Freddie so. “You talk big, don’t you?” he says. 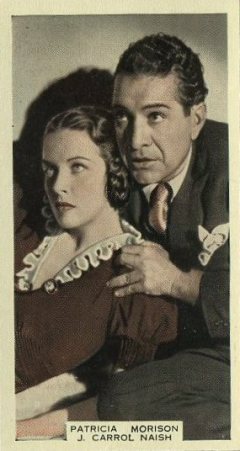 Above: Patricia Morison and J. Carrol Naish. Even before Freddie entered the beauty parlor, Persons in Hiding makes it clear that Morrison isn’t undertaking traditional leading lady chores. For just a moment her Dot looks like any other sweet ingenue as she tends to the beauty parlor’s last customer of the day. She’s so clearly envious of her customer’s fur coat that the woman allows her to try it on. With her back to the customer, Dot discovers a pricey-looking compact in one of the fur’s pockets. She slips it into her own pocket. The woman takes her coat back, pays Dot, and tacks on a generous tip, which doesn't even cause Dot a momentary pang of guilt. Dot also admires her perfume, $50 an ounce, she’s told, as the empty bottle is cast into a trash can. After her customer leaves Dot picks the empty bottle from the trash, fills it with water, and dabs the diluted potion behind her ears. 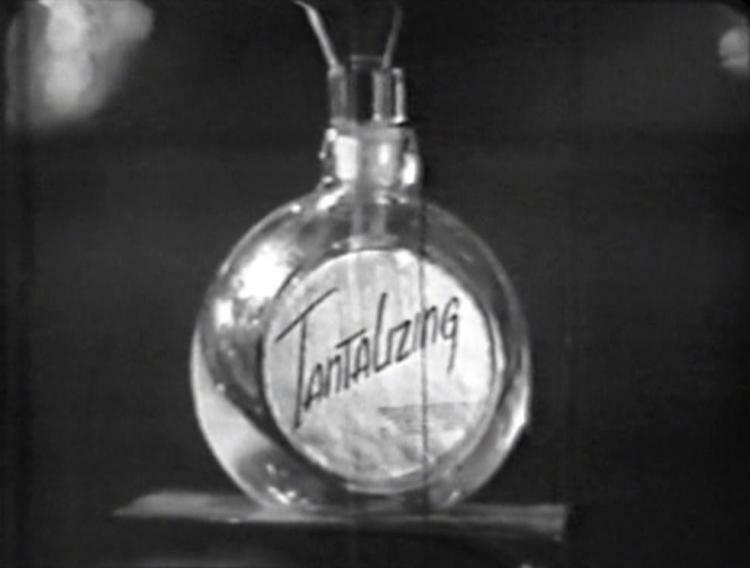 The perfume is called Tantalizing, and soon Dot will never be without it. For her it represents freedom and success, and Dot’s hellbent on having it at any cost. Later it will play a role in her downfall. 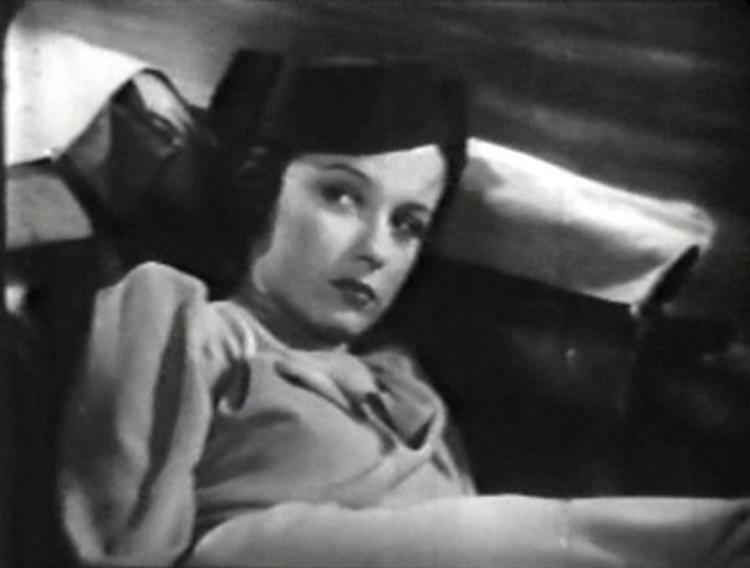 In Dot Bronson, Patricia Morison plays one of the iciest femme fatales of Hollywood’s Golden Age. She’s both Freddie’s inspiration and his teacher, training him to shoot straighter, planning all of their heists, and, in an especially bold moment, their publicity. Dot has true feelings for Freddie, but as he says, “You love me as much as you can love anybody, but it ain’t enough.” She’s as tender towards him as her cold blood allows, even backing off when Freddie threatens to leave her if she goes back on her word and bumps off a kidnap victim instead of returning him safely as planned. Dot has an even softer spot for her mother, or actually foster mother as one headline reveals. She grew up on a run-down farm and her father is a man who has a million things to do, “someday, when I get around to it.” Her husband and her mother are the only two people Dot cares about, though a definite pecking order emerges that puts Freddie in the second slot. Despite being based on portions of Hoover’s book, it’s hard to care much about the exploits of Federal Agent Pete Griswold (Lynne Overman). He and his partner, Dan Waldron (William Henry), don’t make an impact until the movie is halfway over, and are only given a few scenes to put their skills on display. The best of these comes when Griswold questions freed kidnapping victim Burt Nast (William Collier Sr.) to pull forth the most minute, seemingly meaningless, details about his ordeal. Nast doesn’t think he knows anything of value, but Griswold pieces together his answers to form a clear map to the gang’s hideout. Griswold’s other big moment comes when he follows those clues to arrive at the Bronson ranch, where he poses as a peddler to gain entrance. The ruse is going well enough, confirming many of the details Nast provided, but winds up with Griswold strapped to a chair on the verge of being burned alive. Persons in Hiding compares well to Gun Crazy and even predates it by eleven years, but in comparison is forgotten. There’s no better way to measure modern reach than looking at the total number of votes cast at the IMDb. Gun Crazy is nearing 7,000 total votes, one of the best known films of 1950. Earlier tonight I cast Persons in Hiding’s 12th vote, rating it the same as I did at the top right on this page. It suffers the sad fate of being a neglected Paramount release, one which, as my screen captures attest, can only be found in grainy gray market recordings. Is it as good as Gun Crazy? Probably not, though I prefer the take-no-prisoners pacing of many ‘30s “B” films to the more stylized and better celebrated noirs that came along a little later. It’s easy enough to see Gun Crazy . Persons in Hiding isn’t even going to play on television, never mind ever garnering an official home video release. Good luck finding a copy, though my FindOldMovies search engine points the way to a few sources. 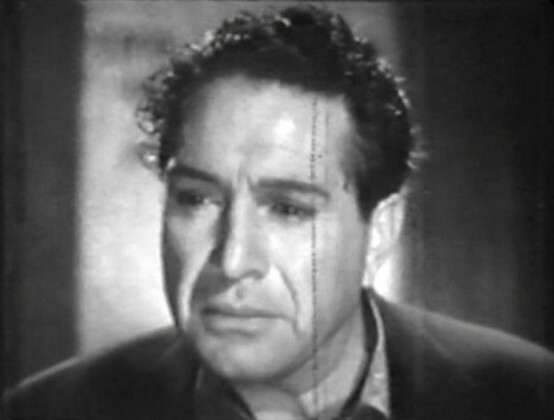 Above: J. Carrol Naish somehow gets us to care about him. Partially as the lesser of two evils, partially through a surprisingly effective performance. 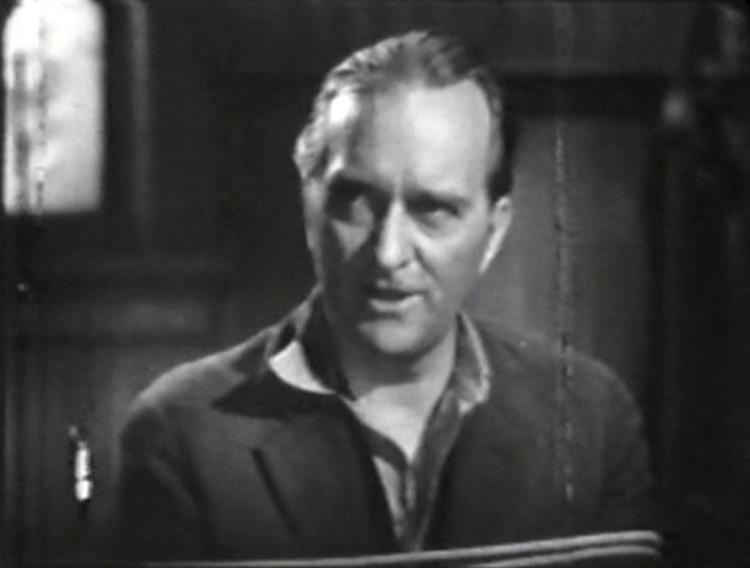 Persons in Hiding was the first of four films Paramount adapted from Hoover’s book, actually ghostwritten by Courtney Ryley Cooper. The others are Undercover Doctor (also 1939), Parole Fixer, and Queen of the Mob (both 1940). Hoover’s book highlighted several of the FBI’s most notorious cases with Dot Bronson of Persons in Hiding inspired not only by Bonnie Parker, but also Kathryn Kelly, wife of “Machine Gun” Kelly. I believe it is Kelly that Miss Morison tries to recall in the 2013 interview linked near the top of this page. I picked up my copy of Persons in Hiding for additional Helen Twelvetrees research (a book is coming, and coming soon), but she’s only in one scene and makes no impact. 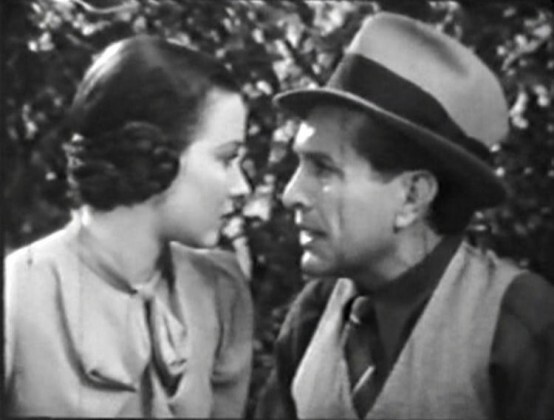 I wasn’t planning on covering the movie on the site, but was inspired to do so after my friend Laura, of Laura’s Miscellaneous Musings, wrote about one of the follow-ups, Parole Fixer (1940). Plus, I enjoyed it a lot, despite its all-time low score on the 12Trees Scale. 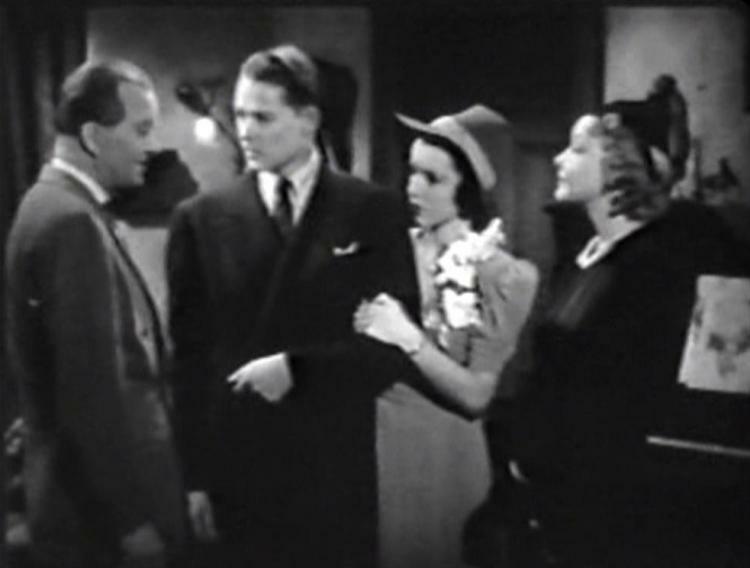 Above, left to right: Lynne Overman, William Henry, Janet Waldo, and Helen Twelvetrees. Mary Elizabeth Strunk, “Mother Barker: Film Star and Public Enemy No. 1,” in Mob Culture: Hidden Histories of the American Gangster Film , ed. Lee Grieveson et al. (Rutgers: Rutgers University Press, 2005), 161. 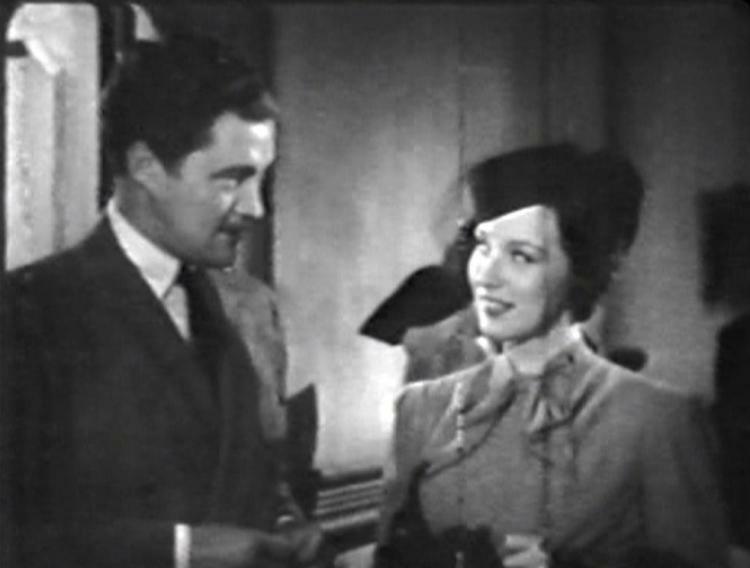 Above: Richard Stanley with Patricia Morison. Stanley would soon be known as Dennis Morgan. "Unquestionably top-of-the-bill quality from every angle." Trade ad from Motion Picture Herald, February 4, 1939. Cliff, just a note to say how much I enjoyed your post. I’m very glad these films are getting the attention they deserve. I was amazed by how much the film foreshadowed GUN CRAZY yet as you note it seems no one has given it any attention. I would love to see the Film Noir Foundation restore and show this film. Hope that our posts will help get the film more into the public eye. And thank you for the link! Thanks again, Laura. We’ve talked this one over on Twitter, but I’ll just add here, totally agree with you. I haven’t seen this movie, but was intrigued with the comparison to GUN CRAZY (which is a favorite). I had read about the PERSON IN HIDING series and the book before, the latter an interesting effort from Mr. Hoover. Now, I want to see the movie! I definitely recommend seeking it out. Patricia Morison may be even scarier than Peggy Cummins, very icy and emotionless. It’s also got some nice behind the scenes clips from behind the scenes at the FBI labs. Well, not quite Bonnie and Clyde, but includes direct dabs of inspiration from FBI director J. Edgar Hoover, who wrote the book of the same name. Fast-paced tale covers formation, rise, and fall of husband and wife gangster team in just 70 minutes. Patricia Morison’s movie debut features her as one of the most cold-blooded women from all of Golden Age Hollywood.